Duggan Heights – Now SELLING!!! Get your lots today. All done! Another beautiful custom home completed. This Bayshore home in Qualicum Beach is 3 bedroom and 2 bath and is 1900 square feet and has all the high end features you have come to expect from a Bayshore home. Rare Parksville Lot – 136 Lee Ave – only be $260,000.00 +GST. Sold!! This 2000 square foot Bayshore rancher includes all the bells and whistles. Check out our web site for more information. 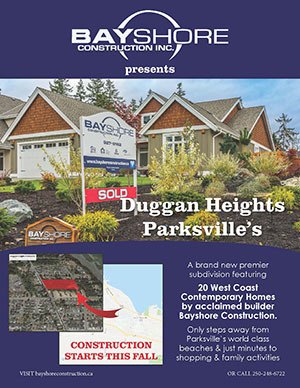 Your New Custom Lot is here in Parksville. The Boquist renovation is coming quickly in Errington. Trusses later this week and roofers next week!